BEWARE – Never buy a car that has been in a previous accident! This is the cardinal rule of car buying. When looking for a good used car, choosing a car that has been in an accident is never the right choice. Today’s cars are extremely complex. There are many sophisticated systems all operating together and sharing vital feedback information from each other. The slightest modification in one system can adversely affect another seemingly unrelated system. As an example, the airbags that were deployed will need to be refitted and synchronized with the car’s computer sensors. Those sensors will then need to be mounted and carefully calibrated. Also highly sensitive ABS braking sensors and controls as well as stability control sensors will need to be expertly repaired to the exact factory specifications to keep you and your family safe. It is an overwhelming prospect to think that a body shop can (or will) get everything perfect. Buying a car that was in a previous accident is a bad idea. Safety and resale value decline sharply when a car has been in a previous accident. Frame damage severely compromises the integrity of a vehicle’s structure. Once your car has been “dented” it can no longer absorb the impact that it was designed to withstand. For a simple illustration of this, imagine a soda can. 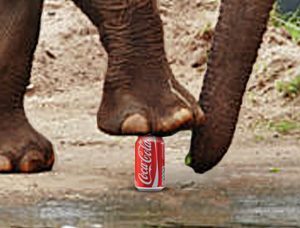 If you were to step onto the top of a soda can you will notice it will be able to take most, if not all, of your weight. 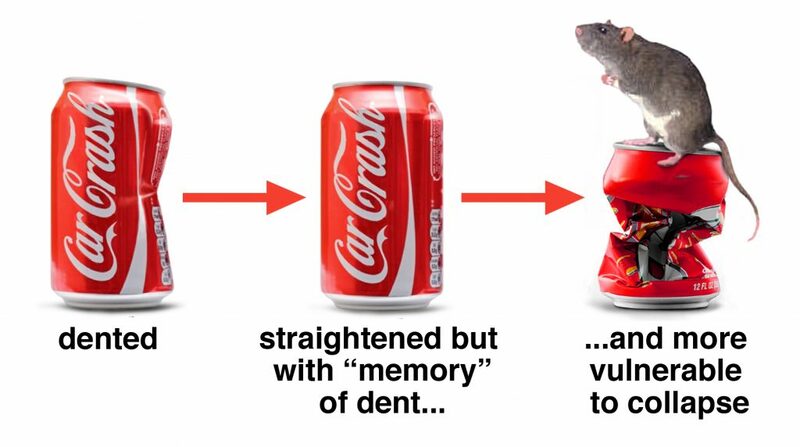 Now if you were to put a small dent in the side of the soda can (no matter how small, and this is the important part) and try to “straighten” the can back to its original shape, it will no longer be able to take even a fraction of your weight. The structural integrity of the can has been forever and permanently compromised. The metal will always have a memory of that dent and will be fatigued in the area of the dent. Just like the soda can, your car frame will be compromised in that area making it highly vulnerable to complete collapse. That is a major safety hazard. Simply put, a car that has had previous damage is no longer safe for you and your family! A good body shop can make the car look original after an accident but the problem is that its strength and ability to absorb impact as well as its paint is no longer original. What looks good on the dealer’s lot or the seller’s driveway will quickly start turning bad after you buy it. There are problems that the repair shop will never be able to return to factory original. In a car that has had after-market paint work, you will see that as the years pass oxidation will occur at a different rate on the body panels and the result is that you will notice paint discoloration become more and more pronounced. Flaking will start to occur where taping was done and it is quite common to see how a poorly taped edge begins to age, leaving behind the scars of a previously damaged car. The value of your car will be far less than a car that is in original condition with factory paint. The Paint Spy – Accident Detector is your best friend in searching for an accident free car. It is the ultimate truth teller no matter what the sales person or the private seller tells you. You are armed with the most powerful tool that will reveal if a car has hidden repairs. Within 1 minute you will have proof whether the car is accident free or not! Visit our companion site carbuyingsupport.com to learn how to buy a used car.